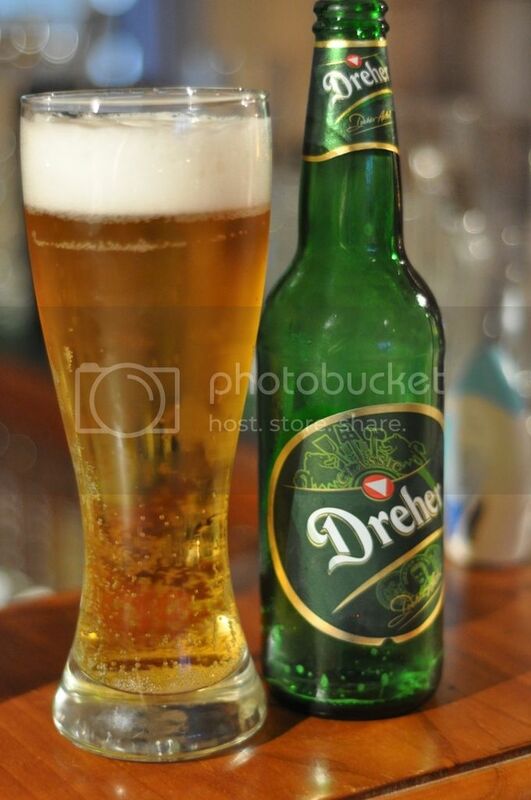 Despite having a friend with Hungarian heritage and hearing that this is an excellent beer, Dreher Classic proved particularly difficult to find. I turned to google and it came up with a Hungarian restaurant in Elsterwick called Budapest. All Melbournian's get down there, I cannot recommend the Hungarian style schnitzel highly enough; absolutely superb. Anyway after my excellent lunch yesterday I managed to convince the guy to sell me a couple more of these beers. Honestly if you are eating a cheese and sausage filled schnitzel this is the beer to drink with it! Hungary produces more beer than Switzerland so I did expect quite alot from this beer, the fact it's recently been acquired by SABMiller is unfortunate but I still expected it to be good. On to the pour and as expected for a Euro Pale Lager this beer pours a light golden straw colour. Dreher also has a two finger head with small to medium carbonation, it does however look excellent. The head last's for at least half of consumption and does ring the glass rather well, but the lacing is slightly disappointing. For those who will point out that this beer glass looks dirty due to the bubble formation down low, I will just say it is just badly scratched and I am looking for a new one! The beer smells like your average Euro Pale Lager. This one has a slightly maltier smell than others from the region but there seems to also be a decent ammount of hops on the nose. There is a spicy character to these hops and they are by far the most noticeable feature of the aroma. Overall this smells like you average Central to Eastern European Lager, pretty standard and uninteresting. When you taste this beer you will be hit by a rather strange feeling, that this beer is not your average beer. Although it smells like an average lager the taste is almost unrecognizeable of being a beer. Dreher Classic has a very mild taste with a honey flavoured malt but characterized by an excellent spicy hops with a bit of bite. The hops are absolutely perfect, not too bitter to offend but bitter enough for someone like me who likes some bite to their lagers. This beer is superb, especially with a slightly fatty food. I would recommend you go down to Budapest restaurant in Elsternwich and have a schnitzel and some of this beer. The dark beer is called Dreher Bak and although thick is very flavoursome (a review of this may follow.) If the importer will sell me some I am going to get more of this for Summer, it is highly refreshing and very drinkable. Get on this if you can as I reckon in a few years it will be unobtainably expensive here.